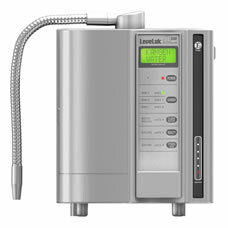 Kangen Water Read This Before Buying! 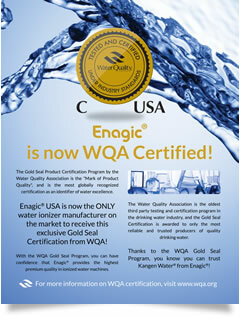 Breaking News: Enagic® Has Been Awarded the Gold Seal Certification by the Water Quality Association! The delicious alkaline Kangen Water® you enjoy drinking every day is now certified by the Water Quality Association! WQA is the international “Mark of Product Quality” and is recognized around the world as the leading certification of water excellence. 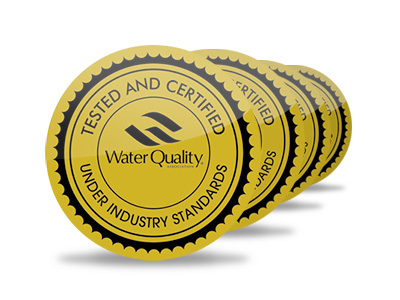 The Gold Seal Certification from WQA is awarded to the most reliable and trusted producers of quality drinking water. Enagic® USA is now the ONLY water ionizer manufacturer on the market to receive the Gold Seal Certification! 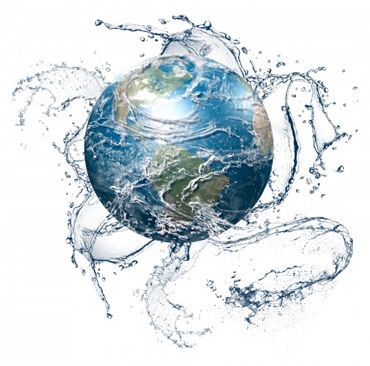 This is why Enagic® is known as the “Gold Standard” in water ionization. No competitors can compare with the honest, dependable quality of Enagic® machines. 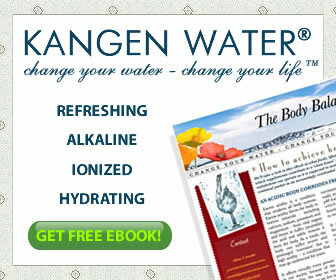 You can always TRUST ENAGIC® to provide healthful, clean, ionized, and alkaline Kangen Water® for optimal hydration. 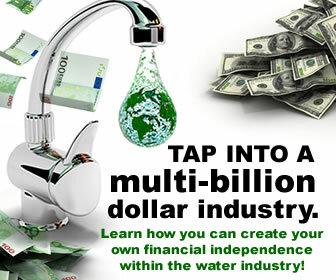 Yet again, Enagic® blows the competition out of the water! Everyone drinks water, so shouldn’t they be drinking “tested and certified” water? Families, commercial business owners, schools, doctors…they ALL need healthy water and they ALL need a WQA-certified Enagic® machine to generate Kangen Water®! It’s impossible to not get EXCITED about the Gold Seal Certification for Enagic®. The WQA has validated what we’ve known all along: Enagic® delivers unparalleled, premium quality ionized water. For more information on WQA certification, visit www.wqa.org. NSF/ANSI 42 Drinking Water Treatment Units, Aesthetic Effects This standard covers point-of-use (POU) and point-of-entry (POE) systems designed to reduce specific aesthetic or non-health-related contaminants (chlorine, taste and odor, and particulates) that may be present in public or private drinking water. NSF/ANSI 372 Addresses point-of-use (POU) and point-of-entry (POE) systems designed to reduce lead contaminants. CSA B 483.1 Drinking Water Treatment Systems Canadian Standards Association (CSA) developed additional requirements, outside the existing NSF/ANSI standards, to meet plumbing, mechanical, and electrical requirements for drinking water treatment components and complete systems. Products under this scope include POU and POE plumbed systems and POU non-plumbed systems. 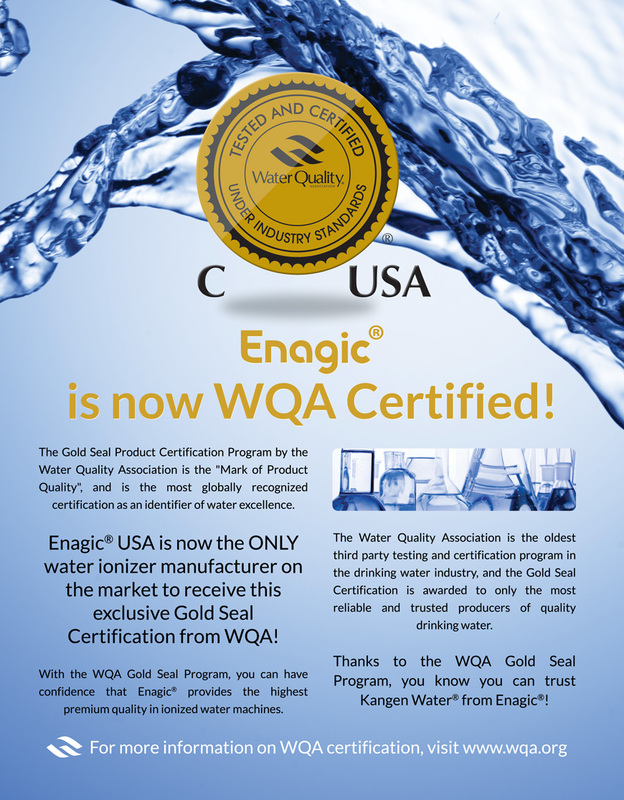 As a proud recipient of WQA’s renown Gold Seal certification, Enagic® continues to push the envelope for superior water quality, taste, and purity for commercial operations all across the globe.